A patient registration form is required when any patient is admitted to any hospital. The form is also known as admission form or registration form. The main purpose of using this form is to collect all the information related to the patient. The main details which are included in the form are date and the time of arrival of the patient, name, age, date of birth, marital status, complete medical history and other relevant details. Some other additional details which are included in the form are contact details of the patient, insurance card number, payment assurance etc. The registration of the patient is needed to keep track of the number of patients which have been admitted to the hospital. The hospital can then make further arrangements accordingly. The record of the patient can be very useful if he comes again for the treatment. Basically, the patient registration form is used by the administrative department of the hospital. A patient registration form is one of the most important documents which are used in healthcare centers. The form can be filled either by a patient or in case the patient is in an emergency or having a serious injury, the management of hospital may ask the siblings, family members or close friends of patients to fill it. The assurance of money is also done if the patient receives any insurance policy. If the patient is not mentally stable to fill the form, the hospital can admit the patient temporarily without form till the patient is mentally sound to discuss all the matters. There is no specific format or layout of the form, however, most of the forms are prepared in a simple format. There are some very basic details which are included in the form such as personal information of the patient, medical history which is used for any type of medical procedure to be given by the hospital. Patient registration forms are used by almost every hospital. The format of the form varies from hospital to hospital. Every hospital wants to use the form that has a professional look. The form also serves as a legal document in case of death of any patient occurs because of any mismanagement in the hospital or in case anyone wants to determine the insurance amount. The patient registration form can be prepared by anyone by hand or electronically. The form is prepared and kept by the management of the hospital in advance before the patient comes for his/her first appointment with the doctor. 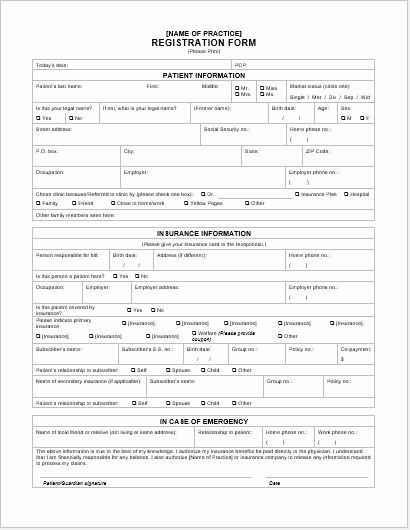 You can get the template of the patient registration form from the internet. There are lots of websites which contain the template free of cost. There are lots of easily editable fields in the form which makes it very easy for the person to create and design the form. These templates are very easy to use and the user can customize it according to his/her needs. You can also include some other details in the form specific to your hospital.